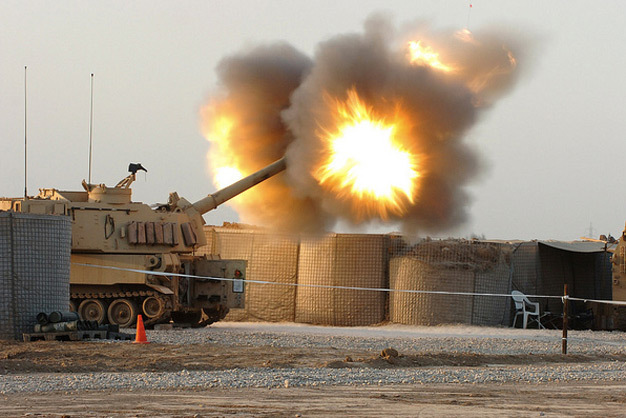 Soldiers from Battery A, 1st Battalion, 82nd Field Artillery Regiment fired the howitzers on their M109A6 Paladins during the first-ever firing of the Modular Artillery Charge System in the combat zone by an entire Paladin battery March 13, 2011 on Camp Taji, Iraq. The MACS is a newly refined propellant that pushes projectiles out of the barrel of the howitzers. US Army photo by Staff Sgt. Jon Cupp, 1st BCT, 1st Cav. Div. Public Affairs.